Realist painter, Phyllis Plattner’s images are of political art, anti-war art and activist art. She juxtaposes the horrors of war with peaceful images to show both sides of the human condition. She frames these images in beautifully shaped frames and gold leaf. My two recent series oil and gold leaf paintings called Legends and Chronicles of War grow out of the impact of living for extended periods of time in two foreign cultures, Chiapas, Mexico and rural Tuscany, Italy. I have lived on and off in Chiapas over many years and happened to be there during the surprise indigenous Zapatista uprising of 1994. Later I lived in Italy while teaching at MICA's study abroad program at Studio Art Centers International in Florence. In Legends, little woolen dolls representing the Zapatista warriors, made by Mayan women during the Chiapas revolution, appear as protagonists in the Christian narratives of Italian renaissance painting so prevalent in Tuscany. 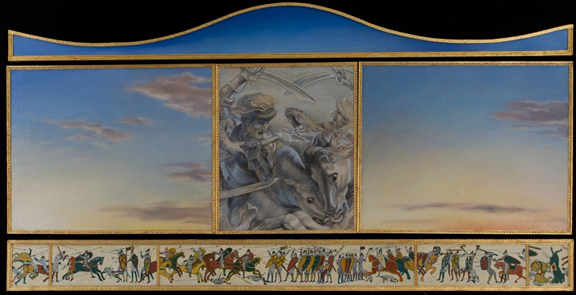 In Chronicles of War multiple panels are assembled like renaissance altarpieces, telling the history of human violence through the accumulation of images from diverse cultures. The catalyst for all the paintings is my horror at the ubiquity and inanity of warfare throughout the history of the world, sadly including our own times. These paintings remind us that all cultures have made art depicting and glorifying their wars; throughout history paintings, sculpture, decorative friezes, ceramics, weavings celebrate victories and idolize warriors. Not until Goya painted did depictions of the madness of war appear. Surprisingly, renaissance Christian iconography reinforces the glorification of violence. Saints are depicted suffering at the hands of other human beings: they are beaten, decapitated, roasted in flames, mutilated, hung upside-down. In my paintings violent images are quoted from both warring and religious sources, as so many wars are fought in the name of God under religious auspices, an association I find both unholy and unfathomable. In the paintings I invite comparison of paired religious and warfare images through the symmetry of the altarpiece format. How does the black man who is lynched compare to the Saint who is shot through with arrows, or the soldier who has two prosthetic legs compare to Christ nailed through on the cross? I want these thoughts to occur secondarily, with the religious format, gold leaf borders and decorative, patterned adornments in the paintings leading you to expect a different kind of story, spiritual and calm. Peaceful images also appear in the paintings to contrast with the violence and to show the other side of the human condition. As warfare is a universal drive so is the opposite, the equally powerful urge for harmony and beauty. Images of bucolic, peaceful skies, mothers and babies, putti, are also quoted from art history, meditations on the stunning contrasts within the human heart. 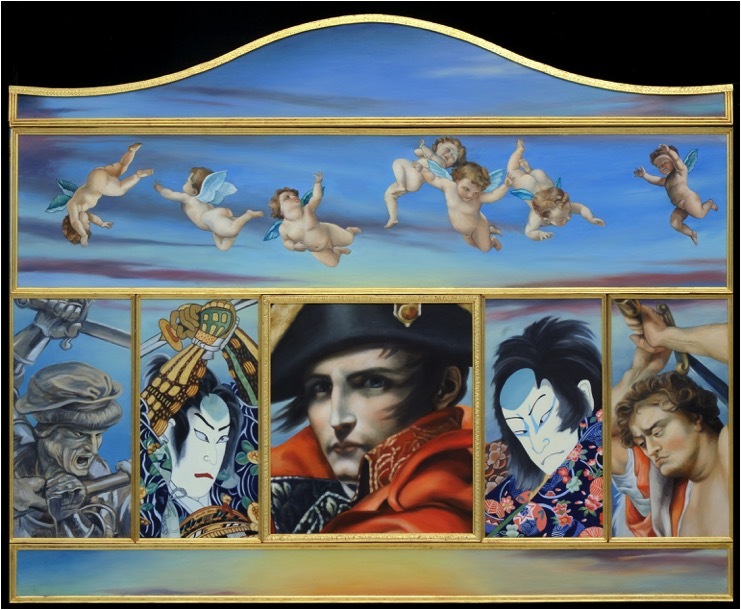 Why, in 2001, did Phyllis Plattner, an accomplished representational painter of huge interiors, jungles, and common household objects, turn to completely different work, a strange and intriguing series of multi-panel paintings, Legends (and later the Chronicles of War series), with colorful yet awkward fictional figures on elaborate gold-leaf grounds? A confirmed painter from reality, she had never worked before from pre-existing images and styles, or on political subjects, which she does in the new work. As the artist explains: Categories that could describe this work may include political art, anti-war art, activist art, appropriation art, quotation art, alter-pieces, multi-panel paintings triptychs, polyptychs. The first three categories refer to the content of the paintings, the next two to approach or tactic, while the last four describe their format. Aside from numerous new movements in the contemporary art scene from the late'60s on, what prompted the sudden shift in her work seems to have been the traumatic political events, revolutions and wars taking place worldwide at the turn of the millennium. During 1994 she witnessed firsthand a dramatic uprising in Mexico, which lead to the Legends paintings in the summer of 2001, almost as a premonition of the 9/11 disaster at home. While the mental or psychological origin of these works may be multiple, their format and many of the subjects of individual images stem from the two foreign countries and cultures that she experienced extensively earlier in her life. During the past decades Phyllis had lived for long periods, on and off, in Mexico with her cultural anthropologist spouse, Stuart Plattner, who was conducting research on the Mayan highlands in the state of Chiapas. And from the '90s on, they both lived for several semesters in central Italy where Phyllis started teaching in the MICA program in Florence. Her long exposure to Mexican folk art and to early Renaissance panel paintings with gold-leaf background provided the stimulus and backbone for both the Legends and Chronicles paintings, although their deeper content results from a combination of her interest in the history of art and her human/social concerns-fundamentally her deep objection to violence and war. In the Legends, as Plattner explains in one of two excellent statements on her website her initial group of protagonists were taken from "The Small woolen dolls representing the Zapatista guerilla warriors that Mayan women made in response to the indigenous uprising there of January, 1994, (while) the ski-masked, machine gun-toting dolls depict Subcommandante Marcos, the uprising's leader." Her figures have the awkwardness of mannequins, yet they are threatening in their inhuman, masked invisibility. Their stick-like limbs and blunt bodies create a pathetic and powerful contrast with the ideal personages in those biblical scenes by Italian Renaissance painters that were the basis of almost all of her panels of this series (and some in the next). One recognizes fragmentary quotations from famous masters, such as Duccio, Simone Martini, Fra Angelico, Uccello, Mantegna, Leonardo, Grunewald, van der Weyden, Caravaggio, and Guido Reni, with some from less known ones, such as Daddi, Antonio Vivarini, Perugino, Fra Bartolomeo, Albertinelli, and Domenichino. 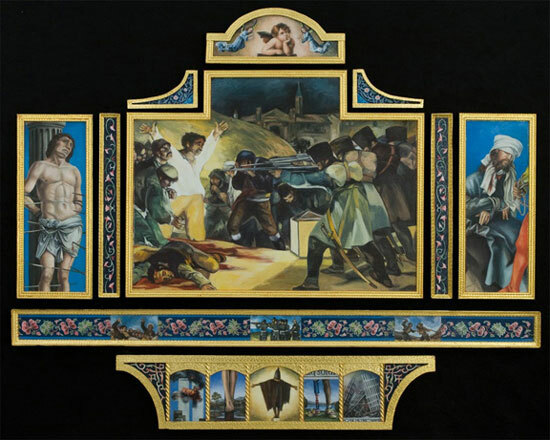 However, in #42/Polittico (Polyptych), after Bernardo Daddi, the eight panels of the predella narrate by the day the events of the 1994 insurrection in Mexico, while the arrangement of the main panels above matches a Sacra Conversazione by Daddi. It is just a short leap from Catholic Mexico, with its gilded church interiors and colorful, dressed up Madonnas and saints, to the religious myths of Renaissance Italy. Nor is there a wide gap between religion and war. In addition to the guerilla dolls' clunky guns and rows of ammunition (with Mexican toy airplanes and helicopters in the predells of #32 Polittico), more modern war machines started appearing in Legends (#43/In God's Name): and in the Chronicles real war horrors came to be juxtaposed with stories from the life of Christ or saints, depictions of angels, and patterns derived from textiles and architecture. In the two Legends series, colors are inspired by a blend of Mexican folk art and early Italian painting, as are many of the decorative motifs. Plattner seems to have relished ransacking the history of art and recreating numerous wondrous images, while maintaining a subtly gorgeous palette startlingly at odds with doll figures and "naïve" renderings. Some the depictions are childlike, even hilarious, such as Mary Magdalene in Glory or the lambs and donkey in the Adoration (from actual handmade Mayan wool animals), but a number of the scenes, such as the Visitation and the Deposition, are gentle and touching. With extreme skill, Plattner coveys tenderness and deep human emotions through stick-like, crude toy forms. In 2006, after a troubling trip to China, Plattner embarked on her second series, Chronicles of War. with art historical citations and decorative patterns from different periods of European, Latin American and Asian cultures - ranging from Uccello's Battle of San Romano and Picasso's Guernica, to war scenes in Persian miniatures and Japanese prints. Ferocious battles and brutal shootings, horrendous explosions and bloody beheadings, bombings and fearsome armies (from Mayan and ancient Greek to Chinese or Nazi warriors) are adorned with floral motifs and often contemplated by angels or birds. She maintains from European altarpieces the symmetrical panel arrangements and paring of subsidiary images, but transforms the overall format of the polyptych, sometimes with sophisticated allusions to the internal compositions of the panels (e.g., in Swords and Lances). As each group has a unique theme, the changes of subject lead to different color gamuts as well. Plattner's paintings are rigorously thought out in every detail on an intellectual level, yet the color hits you in the gut on an emotional level. Chronicles of War/Skies, 2010, 48 x 80", oil and gold leaf on linen on panel. Meanwhile, photographic images of contemporary war disasters documented in the press and on the Web invade her art-historical scenes - from horrors of the Vietnam or Iraq war and tortures of the Holocaust or Abu Ghraib, to the destruction of the World Trade Towers in New York, of which two views are included in the predella of Saints and Martyrs. There, Goya's great Third of May shooting is the central panel, while two earlier famous Baroque painters, Velzáquez and Claude Lorain, are the focus of other polyptchs in that series. Escaping the predictability of Renaissance altars, now the arrangements of the panels are constantly varied, dealing with a wide range of themes: Heads and Hands, Swords and Lances, Regiments and Obedience, Horses, Children Moments, Toy Soldiers, Skies and Life. Surprisingly, a peaceful landscape is central to the last four themes in the Chronicles listed above. Here there is an intended contrast between the unfathomable and tragic ubiquity of warfare throughout history and humankind's (or nature's) equally powerful drive toward harmony, beauty and peace, in Plattner's words. The central painting in Skies, a section of Leonardo's Battle of Anghiari, is anchored below by a marvelous long frieze of battles woven into the eleventh-century Bayeux tapestry, yet it is practically surrounded and crowned by a glorious blue sky streaked with pale pink clouds (based on Thomas Cole). On the contrary, in the more recent and equaooy simple grouings, Life, a luminous sunset sky is center, as well as anchor and crown, flanked by four issues of Life Magazine covers with tormented war images and blood-red borders. In these works, the framing alone - with no fragmented, peaked or jagged forms - communicates a peaceful mood. In my initial quotation from her, Plattner describes this entire body of work as both appropriation and political/anti-war art. To this I would add that is far more complex and multivalent in content, being richly and wonderfully human. Growing up in New York City where she frequently saw and fell in love with many paintings in the great museums there, Phyllis Plattner began wanting to be an artist as a very young child. She felt fortunate to begin her art studies at the stimulating High School of Music and Art where she was exposed to like-minded students from all over the city who all shared the same passions; she continued studying painting at Bennington College in Vermont where she received her BA and at Claremont Graduate School in Claremont, California where she received her MFA. She now teaches at the Maryland Institute College of Art in Baltimore, again among a group of like-minded passionate souls, where she has taught for the past 23 years, including two semesters in their recently begun program in Florence. Before moving to Bethesda, Maryland she taught at Washington University School of fine Arts in St. Louis for several years, becoming the Wallace C. Smith Distinguished Professor for the last two years. Over the years Plattner has lived for extended periods of time in several foreign countries with her anthropologist husband while he was doing his field research; the different cultures she experienced have had a major impact on all aspects of her work, substantive, formal, conceptual, aesthetic, emotional. The places she has spent the most time are first the city of San Cristobal Las Casas in Chiapas, Mexico, and more recently Tavarnelle val di Pesa, a small rural town in Italy outside of Florence. Her work of the last several years deals with the interface between those two places and the thoughts, emotions and associations they evoke both together and separately. She was in San Cristobal in January, 1994 when the Mayan Zapatista uprising occurred; this was a shocking event with a powerful and permanent impact and it changed the direction of her work. Going from Chiapas to the Tuscan countryside which at first glance seems purely bucolic and peaceful she soon became aware of the deep history of constant warfare that was written across the agricultural landscape of orchards and vineyards, constant attempts at conquests and rebellions forming the now beautiful and charming fortified hilltowns. 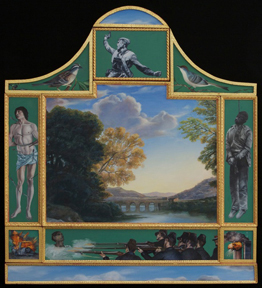 Her most recent work, an on-going series of oil and gold leaf multi-paneled paintings called Chronicles of War, grapples with these issues, drawing on art historic warfare imagery from across the globe and contemporary news photographs juxtaposed together in Italian renaissance altarpiece formats and contrasted by historic images of angels, putti, madonnas, babies, and decorative ethnic patterns. Plattner has exhibited her work in cities throughout this country including New York, Chicago, Baltimore, Washington, DC, St. Louis, Santa Fe, Los Angeles among others, as well as in colleges and universities across the country, and in Paris, Florence, and Brittany, France. She has also been a guest lecturer in art schools, universities, and museums, including RISD in Rhode Island, Columbia College of Design in Chicago, New York University and Columbia University in New York, Temple University, Rome, the St. Louis Art Museum, and the Corcoran Gallery in DC. Grants and honors she has received include a National Endowment for the Arts/Mid-Atlantic Fellowship, several Maryland State Arts Council grants, and many faculty development grants from the schools at which she has taught. Washington painter Phyllis Plattner's semi-classical pictures depict bombings, shootings and decapitations. Argentine-bred glass artist Silvia Levenson's wall sculptures simulate baby clothes in bright, nursery school hues. Yet both women's work carries the same theme: war. Two floors apart at the American University Museum, their art ponders historical violence in ways that are deliberate yet immediate. Although their methods and inspirations are quite different, Plattner's "Gods of War!" and Levenson's "Identidad" are equally vivid and personal. Levenson was not only in Argentina in 1976, but also pregnant when people were "disappeared" and their babies awarded to government loyalists. Plattner was visiting Mexico's Chiapas state in 1994 when Mayan rebels known as Zapatistas began a revolt against the national government. She began collecting locally made dolls of masked Zapatista fighters, but it wasn't until five years later, when she was living in Florence, that the dolls entered her work. Plattner began reimagining Italian masterpieces with the dolls in place of religious and mythological figures. Some of those works are included in this exhibition, but the painter didn't fully engage her subject until she began emulating Renaissance altar pieces that group multiple scriptural scenes in gold-framed symmetrical arrangements. Within this ornate format, Plattner incorporated notable pictures by such bloody-minded maestros as Caravaggio. But while Plattner's compositions are derived from 14th- to 17th- century Italy, she doesn't quote only from that time and place. She pairs renderings of biblical murder and martyrdom with Goya's well-known depiction of a Napoleonic-era firing squad and Picasso's even more famed "Guernica." Plattner also roves beyond Europe, incorporating Asian and Meso-American images of battle and warriors. All are rendered in close approximations of their original styles, whether Japanese woodblock prints or Picasso's cubism. It may be the black-and-white "Guernica," details of which feature in several of the multi-part paintings, that led Plattner to incorporate photographs. She uses oil paints and brushes to replicate iconic snapshots from World War II, the Vietnam conflict and more recent cataclysms. Separated by gold-leaf borders are the entrance to Auschwitz, the naked Vietnamese girl fleeing a napalm attack, the World Trade Center towers ablaze, an abused prisoner at Abu Ghraib and African child soldiers. Many of these images are instantly recognizable, yet Plattner doesn't allow them to overpower her overall compositions. Arranged into suites, the paintings pair infamies across eras, matching romanticized legend to stark photojournalism. "Chronicles of War/Heads and Hands" is a fugue of horrific wounds and deaths. In "Chronicles of War/Moments," a dying St. Sebastian, pierced by arrows, looks away from the corpse of a lynched African American man. One interesting effect of such juxtapositions is to make visceral the suffering that Christian art traditionally presents as spiritual. Pious viewers may object, but in Plattner's paintings no kinds of torture and killing appear more exalted than others. To make these multifaceted works, the artist mastered many styles and techniques, including the woodworking necessary for the elaborate frames. Such complex pieces can't be made quickly, so the evolution of Plattner's style — and outlook — is inevitably slow. But it seems that her more recent paintings seek a balance between war and peace. Although they're still clustered with images of killing and mourning, some panels are devoted to birds, cherubs or serene skies. The news from the battlefield remains dreadful, but there are other things to behold. From a certain angle, Levenson's "Identidad" seems more cheerful than Plattner's work. More than 100 colored-glass bibs, bloomers and pairs of socks line a long, white wall, evoking the love elicited and hope inspired by the very young. On the other side of the gallery, however, several dozen glass knives dangle over a photo of two young girls — the artist and her sister, standing in for both a later generation and an entire nation. The ominous blades are the show's only visual representation of violence. Two videos explain the fates of the disappeared and the children stolen from their families, as well as the campaign of the Grandmothers of the Plaza be Mayo. (They've helped identify 116 of some 500 babies born while their mothers were imprisoned between 1976 and 1983.) Levenson's work is less outraged than pensive, musing on the loss of such children as the girl in "She Flew Away," which consists of just a swing and a pair of shoes, both made of glass. That material is suitably ambiguous: solid but translucent, heavy yet fragile. Levenson's glass garments catch the light in a lively way, yet are stiff and unmoving, and without bodies to animate them. As clothing for actual children, of course, kiln-cast socks and pants are useless. But as symbols for missing persons, they are poignantly both present and absent. Questions of art and appropriation have been on the collective mind of the art world, and the minds of those around it, for the past several decades. Every year or so an artwork will come along to make sure that it's something that we're all continuing to think about. The Richard Prince versus Patrick Cariou lawsuit of 2011 is the best-known recent example, involving anthropological photography and a lot of (but not enough) stickers and paints. Although Phyllis Plattner's exhibit, Other People's Pictures, at MICA's Pinkard Gallery, falls into the category of appropriation art, she's not in danger of any lawsuits. The exhibit features two series: Chronicles of War and Legends. Chronicles of War works with images repainted from photojournalism and artwork, all easy to recognize. Many images are smaller pictures, snapshots of a larger work. Each of Plattner's artworks is made up of between three and twenty panels, from large to small. Some panels are sized for one large painting and some incorporate several smaller images. Each painting is technically superb, exactly accomplishing the image that Plattner reproduced and rarely abandoning the artist's own hand. (Recall the title of the show.) Between the photo-realistic paintings or semi-reproductions, Plattner includes decorations of birds, cherubs, or bands of colorful floral or geometric patterns. Edged with thin gold-leaf framing or braid in Renaissance style, the panels are collected together in a formal, symmetrical design to create one artwork. The result is a series of ornate collages, ones inspired by Renaissance decoration. Nine of these artworks comprise the Chronicles of War section; complimenting this is Legends, completed first. Plattner was inspired by Zapatista dolls from Chiapas, Mexico and also by the Renaissance's decorative imagery. The works feature the guerilla dolls acting out Biblical scenes and Renaissance paintings after Simone Martini, Bernardo Daddi, Fra Bartolomeo, and Caravaggio. Except for three pieces, this series was made as single panels instead of collages. That difference shifts the area, making it more of a series and less of a collection. But these works are bunched together, all hung on one single wall and not given any room to breathe. Had the walls been available, it would have been lovely to see them hung more spaciously. Plattner uses images carefully and intelligently. Although her titles may seem obvious and simple (Head and Hands, Swords and Lances, Horses), the end result is far from straightforward. Plattner accomplishes great aesthetic results with her combinations of photographs and paintings, especially in Swords and Lances. Toy Soldiers is one of the most touching, and one of the most difficult to look at because of the images of child soldiers. Plattner combines images that might have floated by each other in our minds, but don't usually come together on one page (or canvas) next to each other. When they do, they inspire new and different thoughts, and that, of course, is the goal of collage. In this collection, Platter brings a level of great technical ability and skill to painted collage, and the medium has grown significantly for it. Plattner's subtle political imagery provides an engaging commentary on war and violence, and on the place it has in our society and in our history. She explores the images of war, the ways we imagine it and the things we do with those images. At a time when war continues to spread around the world, art work such as these are even more important than ever.